There are already approximately 100,000 Gen Z homeowners and that number will only continue to increase. While they share some concerns with earlier generations about affordability, 83 percent of Gen Z see themselves entering the real estate market within the next five years. As this newest generation of potential homebuyers enters the housing markets, agents need to better understand their aspirations. One of the more notable takeaways from the survey is Gen Z’s issue with college debt. PropertyShark reported Gen Z sees college debt as the biggest obstacle preventing them from buying a home. Nearly a third of participants (32 percent) said college debt is their biggest obstacle to buying a home — a significant contrast to the 7 percent of Gen Xers who reported the same. Another top concern for Gen Z is the down payment towards a home. This falls in line with worries of previous generations with 30 percent of Gen Z saying this is the biggest obstacle they face, compared to 35 percent of millennials and 31 percent of Gen Xers. However, in spite of the monetary barriers, the majority of Gen Z plan to own a home within the next several years. “Considering that the oldest of Gen Z are barely 23, it is noteworthy that a whopping 83 percent see themselves entering the real estate market within five years,” the report said. According to MarketWatch, only 1.2 percent of Gen Z homeowners are more than 60 days late on mortgage payments compared to the 1.6 percent of baby boomers and millennials and the 2.3 percent of Gen Xers. Gen Z’s aspirational lifestyle is different compared to millennials. While millennials want small and efficient, Gen Z is dreaming bigger. According to PropertyShark, Gen Z wants their homes to be 2,081 square feet on average, which is 200 feet more than millennials. “When asked what they would be willing to compromise on when buying a home, space was the least likely aspect for Gen Z respondents to give up,” PropertyShark said. More important lifestyle aspects Gen Z included are location, air conditioning and lifestyle amenities. 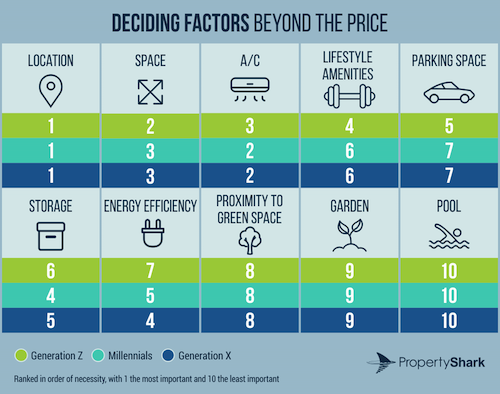 Gen Z also values parking spaces, smart appliances and smart homes. “Considering the youth of Gen Z, the importance of smart systems is likely to increase as more of their cohort enters the housing market,” the report said. 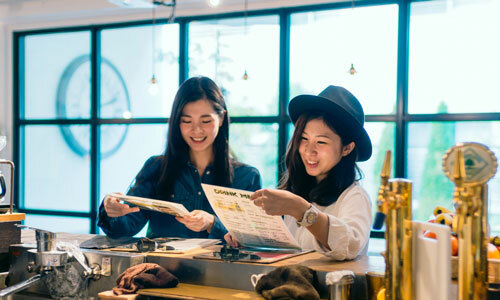 However, Gen Z’s aspirational urban lifestyle may spell bad news for small, rural markets. Similar to Millennials, 30 percent of Gen Z wants to stay in large metros while 60 percent wants to live in suburban areas. For Gen Z, living at home is about what’s practical. Also similar to Millennials, Gen Z are choosing to stay at home until they are able to afford their own. 40 percent of Gen Z said the biggest reason they stay at home is to save up money while 32 percent said they can’t afford rent. Despite the costs, Gen Z are considered the most optimistic about home owning while attaining the lifestyle they want. While Gen Z is able to afford less than Millennials — a few square feet difference — they still plan to jump into the housing market within the next five years.